I’m praising God for today. This morning I joined the Houghton team offering prayers & ‘Bags of Hope’ on the high street. I love that the team underestimated how many prayer slips they would need – people were eager to write down the names of loved ones for us to pray for them. I’m always astounded at the depth of conversation that you can have with a stranger when you offer prayer. I spoke with one young man called David who had just been released from prison & had nowhere to go. I prayed with him & assured him of God’s love. He was genuinely moved & appreciated the fact that hundreds of Christians would be praying for him tonight. So please pause now….and pray for David….Amen. 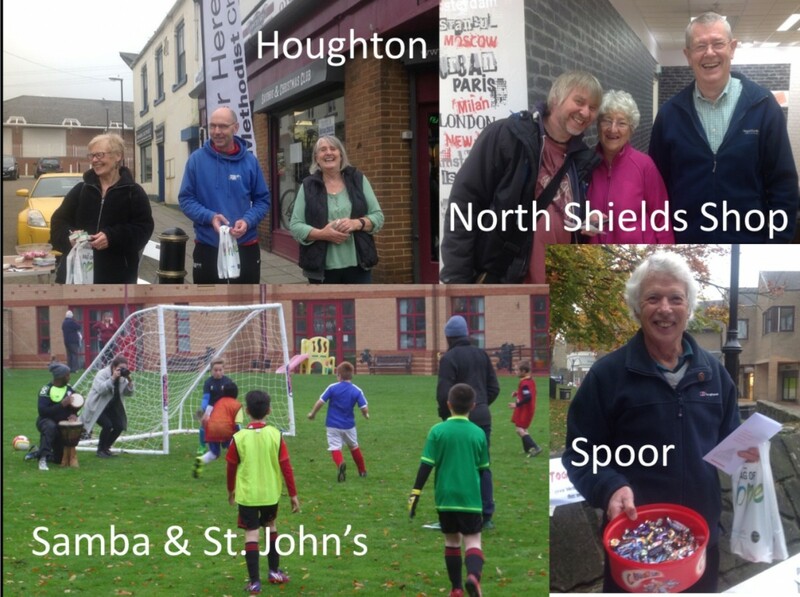 I’d spent so long on the streets at Houghton that I only managed to get to see the team in Sunderland (linked to St. John’s & Samba) pack up! They’re offering sports & crafts on the field opposite the church. What a great way to serve their local community! Then off to North Shields to see the shop. Again, many people are responding well to the offer of prayer & it was a delight to read the stories people had written & posted on the wall. 150 people visited the shop today…I can’t say I’m surprised as the team have provided such a creative, welcoming space in the middle of a busy shopping arcade. Then a flying visit to the Spoor team who were out in Whickham with a prayer table & giving out more Bags of Hope (and chocolates). It was moving to read some of the things that folk had written on the table as prayer requests. My final visit of the day was back to Houghton to speak at their fellowship gathering. My favourite thing today was seeing a team member start the street work very tentatively, not at all sure she could do it. Then about 10 minutes later watching as she confidently walked up to a stranger asking if there was anything she could pray for them. Sometimes God really does do more than we ask or imagine!